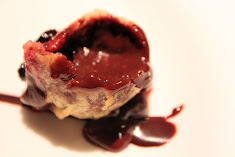 After three amazing years of food blogging on the The Simplest Aphrodisiac, the time has come for this blog to bid you adieu. I know this announcement may come as a surprise to many of you, but I assure you that a lot of thought had been put into this and I'm ready to take this important step. The biggest reason behind this decision is a happy one. I'm proud to tell you that someone very dear and special to me recently said "Yes", not just to me but really to us, and it was a memorable moment that was filled with the purest of bliss. We're now two people very much in love, and we share something that I know I would cherish with all my heart. The question you would probably be asking now is: what does this have to do with the blog? The answer really is related to how this blog had come about, for it was started because of someone else in the distant past. That I would expect my loved one now to share this same space (and memory) would be insensitive, if not unfair as well. No doubt this blog had also seen me through the emptiest of days as it had given me purpose in otherwise silent and unforgiving moments; this is something that I would always remember and be truly grateful for. But the story now is no longer about me alone. A new chapter in life has begun and it is time to start anew. Understandably, this blog has more than three years' worth of painstakingly written food posts, all of which were so meticulously organised from the title down to the individual blog labels. I would be lying if I said I couldn't be bothered or don't feel anything at all at this point; indeed many hours and sleepless nights had been poured into trying to take that perfect picture as well as trying to find the perfect words to illustrate and describe each meal, each spoon or forkful, and each bite. Moreover, I have made many friends through this blog and was also thrilled to have received so many emails and notes from individuals who would have been complete strangers to me if not for our common love and interest in food. I should let you know however that this is not really goodbye, as far as my love for eating and sharing the love for it goes. Perhaps you would be able to find my words and pictures on food elsewhere, but in a space and style that you would not normally associate with a food blog. I must admit though that I have lost some of that eagerness to snap away at my food with my cameras, having returned to enjoying food as it is as well as in the company of others. When I do take pictures it's often with my iPhone, and only because I've been quite fascinated with the artistic effects created by some of the apps that I have. The remnants of French influences in Vietnam can probably be best felt in the numerous French eateries that have continued to stay on in this part of the world, with most concentrated in the cities of Hanoi and Ho Chi Minh City. The Green Tangerine is a fine example, being located within a restored colonial French villa complete with an open courtyard and garden terrace. In many ways this charming sanctuary exudes a rustic, homely feeling, and one which is particularly accentuated by the unpretentious and hearty food that you can find here. The "Australian Imported Steak" was alright, though pretty much on the fattier (and therefore, chewier) side of things. The three different types of potato served on the side were an interesting trio, with the plain and truffle ones delighting me much. The third, infused with some type of cheese which I can't quite remember, didn't appeal to me one bit because of its smell and sourness. Of course I have to admit that I'm not one who appreciate cheeses other than the typical cheddar or mozzarella, so others may fancy this much more than I did. One of the bosses had the Lamb Shank, which he kindly presented to me (for me to take a picture) upon hearing that I have a food blog. Somehow I thought his dish looked a tad more appetising than that thick slab of meat on mine. My dessert of a chocolate and blackcurrent Mousse Cake was quite uninspiring, and the flavours seemed to compete rather than blend with each other. About US$35 for a main and a dessert. Certainly not cheap by Vietnamese standards. Pictures taken with the Apple iPhone 4.
Who would have thought that you could find good Indian food in the middle of Hanoi? I certainly didn't, and so was quite impressed by what was on offer at Foodshop 45. This restaurant is located along the peaceful Ho Tay (West Lake) and is one of the cleaner and more attractive options available on the stretch of eateries and drinking holes. It's also one of the Top 20 restaurants in Hanoi, according to my trusty Tripadvisor.com. Choose to sit at proper tables and chairs on the first floor, or on tatami mats on the second. I did feel a little uncomfortable sitting cross-legged on the cushions (more so because the pants was tight!) and if given a choice would have preferred the usual tables. The Plain and Garlic Naans were pretty good, albeit on a slightly more doughy side. 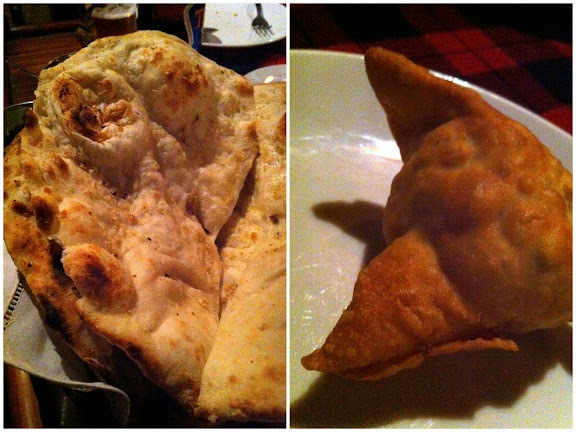 What I liked more actually were the Vegetarian Samosas, which arrived crisp and piping hot. Surrounded by an appetising aroma, it was packed tight with delicious curried potatoes. The Curries and Mutton Keema were decent, nothing much to fault on. The Beef Dum Briyani meanwhile was the highlight of the night for a number of us, as the soft and tender well-cooked beef chunks added much oomph and flavour to the fragrant rice. Very good. Menus are in English. It was a treat from one of the bosses. I think it shouldn't cost more than SGD10 per person. 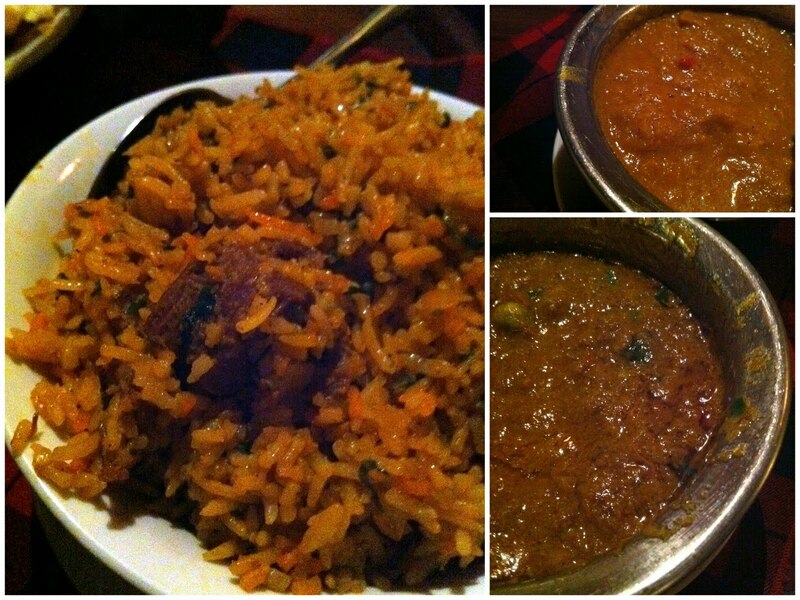 We ordered much more (particularly in quantity) than what you see above, with an assortment of curries to boot as well. Cafe Tivoli at Hanoi Club is a simple, down-to-earth coffee house offering both Western and Singaporean fare. It's one of the places where you can get a ready stash of The Straits Times as you enjoy your hor fun or chicken curry at a leisurely pace. My Ribeye Steak, as it was so called, was quite decent, with an average mushroom sauce and extra crisp (or perhaps, more than twice fried?) shoestring fries on the side. The colleague's Seafood Hor Fun was not too bad as well, but I suppose it was only because we were missing Singaporean food after countless "regional-themed" buffets at the meetings. Hanoi Club is just a 5 minute walk away from Sofitel Plaza Hotel, which if you hadn't known was my "home" for almost a month when many of the major ASEAN meetings were being convened in Hanoi. Aside from its Chinese restaurant Ming Palace, it also has a Western restaurant in Brasserie Westlake. I only found time to try their Spicy Seafood Fettucine, which I have to admit was pretty good stuff because of how spicy it was. Not your usual mild pasta surely, but this is a good Asian rendition. Picture taken with the Apple iPhone 4, with some help from Instagram.